Ruka is in an udon shop, trying to figure out if she wants the curry udon or the kitsune udon with mini curry set. 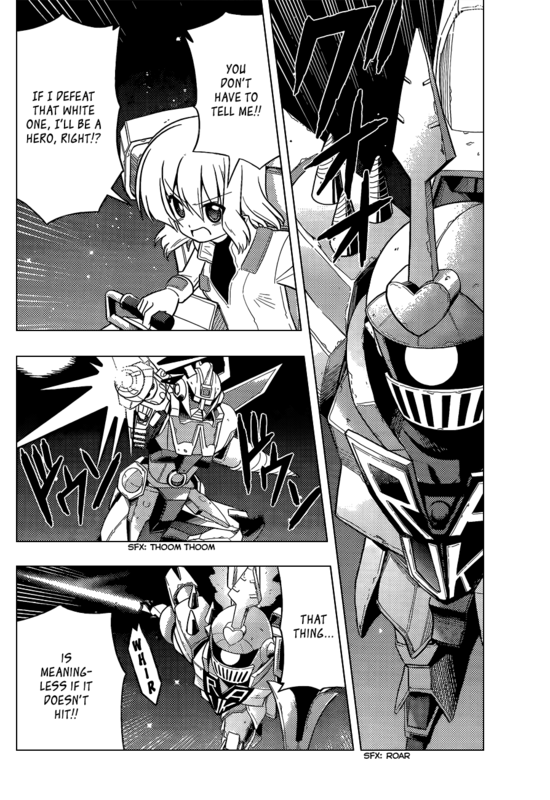 Because she takes too long in deciding, Hayate gives her a small whack on the head with some sort of long, hard item. After crying out in protest over the punishment, Ruka settles on curry udon. At the their table, Ruka starts eating as Hayate asks her about her decision since once she makes her announcement, that’s it. For Ruka, what’s more important is coming up with an ending for her doujinshi manga. Ruka then says she should have gotten the kitsune udon, leading Hayate to think that Ruka wasn’t worried when in fact she was simply avoiding the issue. After eating, Ruka practices her routine, causing Hayate to wonder what is going on in Ruka’s mind. Ruka was lost in a fantasy world, where she’s in a Gundam-like situation in a giant mecha while battling another giant mecha, the pilot of which turns out to be Hayate. The ending has Ruka and her manager defeated by Hayate. This leads Ruka to scold Hayate in reality over his actions in her fantasy. Ruka returns to daydream world where she’s the hero in a fantasy setting, facing a demon king. However, the demons kid shows up, giving Ruka second thoughts on her quest. Hayate shows up in her daydream to kill father and child, upsetting Ruka. The concert arrives and Ruka still has a choice to make. This was pretty much a mark time chapter where we don’t have any progress in the plot. I can certainly understand escapist daydreaming, especially when it comes to writers. My mind is often engaged in a story that I’ve been working on, so I know this well. However, I don’t understand escapist daydreaming being used to make a decision. Apparently, that’s how Ruka decides things. Since Hata-sensei loves Gundam, it is no surprise that he’d have Ruka daydream about a Gundam-like scenario and throw in a number of Gundam references. For Ruka’s fantasy sword and sorcery daydream, I’m not sure if he’s doing a parody of a specific series or if he is just doing a general D&D style parody. We may have been given a clue to what Ruka and Hayate were doing when Nagi busted them. Since Ruka still doesn’t have an ending to her romantic comedy doujinshi manga, I figure that we may get a combination of Hayate and Ruka acting out an ending which could also be recording by Risa and company. Beyond that, I’m finding it difficult to really find anything else to discuss. That’s the problems with chapters that don’t really go anywhere. Apparently, the manga is off next week, so we’ll be back in two. The ending of the Mobile Suit Gundam fantasy mirrors the famous ending of the real series, where Amuro Ray tries to kill Char Aznable and kills someone else instead. OH yeah, I’d forgotten about that. This will be an easy test of reading comprehension and a better manga online. Thanks for this suggestion of new good reads.